It’s a sickness. Whether it’s repeatedly checking for new likes on a pic or mindlessly scrolling through your feed, Instagram can be a tremendously addictive app. And just in time to help feed your habit, Instagram has instituted a new “activity status” feature that shows you the last time someone was actively using the service. 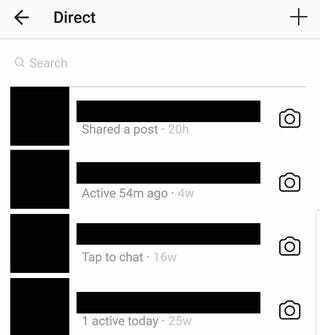 To see the new activity statuses, all you have to do is go into your direct messages and look for the little timestamp that shows the last time someone you’ve chatted with has used Instagram. The times are quite granular; you can see up to the minute or hour when some signed on most recently, while people currently on Instagram are simply labelled as “Active Now.” The update started rolling out yesterday for both Android and iOS users. For those of you who find this addition somewhat intrusive, thankfully it’s not hard to disable. Just go into Instagram’s settings menu and scroll down a bit until you see “Show Activity Status.” Tap the toggle next to it to disable the feature. This move comes shortly after Instagram launched its standalone messaging app, Direct, which offloads your Insta DMs into a separate app—something that seems designed to tear even more users away from Instagram’s biggest competitor, Snapchat.